Wicksell (1898) conceptualised the natural rate of interest as the rate at which the price level is stable. This notion is a basic element of the modern New Keynesian framework (Woodford 2003, Gali 2008). In this framework, the natural rate is the real rate at which the output gap (and therefore inflation) is equal to zero (or more generally, equal to the inflation target) in the absence of temporary shocks. Given that shocks are stationary, monetary policy is expected to gradually move inflation – as well as inflationary expectations when they are unanchored – toward the inflation target. In the standard New Keynesian model, efficient monetary policy can be viewed as using the riskless short term policy rate to gradually move this rate toward its natural rate counterpart. The persistent decrease in long-term interest rates since the beginning of the 21st century, and the intensification of this trend with the onset of the Global Crisis, nurtured the view that there has been a substantial and persistent decrease of the natural rate into negative territory (Curdia 2015, Laubach and Williams 2015). In many developed economies, actual short-term policy rates reached the zero lower bound early in the crisis and have stayed mostly in this range since then. This, along with persistently low and even negative inflation rates, implies that actual real short-term rates are bounded from below by zero. Given these observations, the finding that the real natural rate of interest is negative and is likely to remain in this range for a while constitutes a non-negligible constraint on the efficient conduct of monetary policy. It is therefore important to evaluate the extent to which recent estimates of the natural rate are as low as implied by recent research. Note: Blue shaded areas represent the range of possible estimates with 70% (darker) and 90% (lighter) probability. 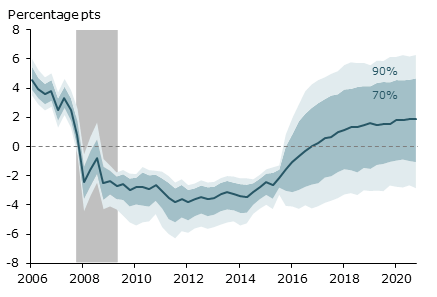 Grey bar indicates NBER recession dates. Source: Curdia (2015), Figure 1. Using a similar but not identical methodology, Laubach and Williams (2015) estimate a long-term riskless natural rate for the 1980-2013 period.3 Figure 2 summarises the evolution of their risk-free natural rate of interest. The figure shows that between 1980 and 2008 this rate decreased from a bit less than 4% to 2% with a dip to 2% in the mid-1990s, a recovery to 3% at the beginning of the 21st century, and a decrease back to 2% just prior to the downfall of Lehman Brothers. Following this event the estimated natural rate takes a further abrupt dip to the vicinity of zero and even becomes slightly negative from the end of 2012. 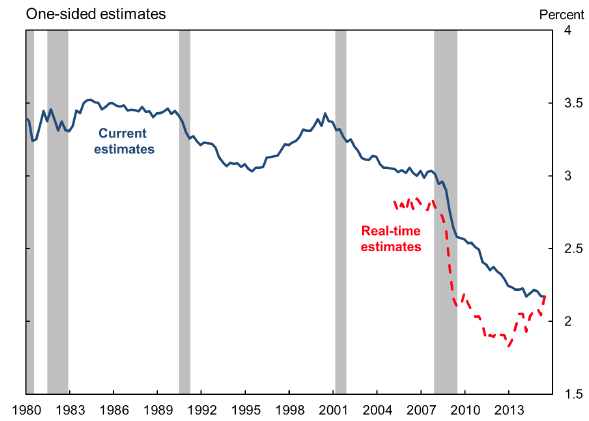 Note: Real-time estimates represent the estimate of the natural rate based solely on data available a few months after the end of the quarter for which the estimate is reported. Source: Laubach and Williams (2015), Figure 5. In this column I argue that, since the New Keynesian model abstracts from credit rationing and from the financial stability motive on the part of monetary policymakers, existing estimates of the natural rate are likely to be biased downward, particularly so since the onset of the Global Crisis. It is well accepted that small and medium-sized borrowers are likely to be credit rationed due to moral hazard, insufficient collateral, and other reasons (Bernanke and Gertler 1989, Bernanke et al. 1999). The decrease in the value of financial assets in the wake of the Global Crisis increased the degree of credit rationing, first by reducing the value of borrowers’ collateral and second by reducing banking capital. Both factors reduce credit and aggregate demand. Since there is no proxy for this effect in the conventional New Keynesian IS relation, the decrease in aggregate demand is interpreted by the estimation procedures above as a decrease in the natural rate of interest. There are additional conceptual reasons which support the view that the ZLB constraint might not be as serious as it recently has been portrayed to be. It is well accepted that long-term risky rates are more important determinants of the output gap and inflation than the short-term policy rate. Since most investment activity is risky, it is more tightly related to interest rates that account for risk than to riskless rates. Real estate investment as well as consumption durables are also risky activities and are, similarly, more tightly related to risky rates. Investment and consumption demands are major components of aggregate demand. Hence aggregate economic activity is obviously more tightly related to risky than to riskless rates of interest. This view is supported by empirical findings in Gilchrist and Zakrajsek (2012) (GZ henceforth) that produce a broad-based index of interest rate spreads between risky corporate bonds and riskless US Treasury bonds during the 1973-2010 period – the GZ credit spread – and show that this index possesses substantial predictive ability for future economic activity. GZ further decompose this index of risk into two components: a component capturing the usual counter-cyclical movements in expected defaults; and a component representing the cyclical changes in the relationship between measured default risk and the GZ credit spreads, which they refer to as an "excess bond premium". While the first component captures changes in the actual risk of default, it is likely that the second is a proxy for changes in the pricing of risk. GZ show that shocks to the excess bond premium that are orthogonal to the current state of the economy lead to economically and statistically significant declines in consumption, investment, and output, as well as to appreciable disinflation. Figure 4 in GZ also suggests that the positive relationship between the excess bond premium and economic activity is in evidence during the 2007-2009 recession. These findings are consistent with the view that a non-negligible part of the last great recession was driven by increases in the pricing of risk. The previous observations suggest that defining and measuring a natural rate of interest that also accounts for ‘natural’ long-term risk and risk preference in the economy is a potentially fruitful extension of the existing riskless natural rate concepts. Risk and the pricing of risk are important determinants of both the supply and the demand for credit. Different secular components of risk and of its pricing imply, therefore, different levels of potential output and of the risky natural rate. Recognition of the role of this concept opens the door for a more direct link between the health of the financial system, on one hand, and potential output and the risky natural rate on the other. Since the health of the financial system depends, in turn, on the quality of supervision and of regulation such an approach paves the way for models that would more tightly relate potential output to financial institutions, risk attitudes, and regulation. It also may help establish a more direct link between economic performance, ‘financial mood’ and underlying financial institutions. By changing risk and risk premia, long-term changes in the structure of financial institutions and of regulation affect the long-run level of credit along with risky natural rates of interest. Highly visible traumatic events, like letting a SIFI institution such as Lehman fail after bailing out many other similar institutions, are likely to have a persistent effect on the ‘financial mood’ and through it, on the risky natural rate. During periods of acute financial tensions the spread between longer-term risky and riskless debt instruments widens, providing an explanation for the fact that, in spite of extremely low short-term policy rates, economic activity remains depressed as was the case during the subprime crisis. Furthermore, during crisis times, the importance of risk and the pricing of risk become more important determinants of economic activity relatively to the risk-free rate than during normal times. Importantly, during a financial crisis risky rates go up rather than down. A prolonged recession in the aftermath of a financial crisis can therefore be understood as arising from a persistent increase in the natural risky rate of interest due to increases in both risk and its pricing. Those considerations suggest that during panics and acute financial crises the monetary authority should aim mainly at reducing the natural risky rate. Reductions in the short-term policy rate is one, albeit relatively ineffective, way to achieve this objective. More important are measures aimed at the reduction of risk and of its pricing on longer term financial instruments.8 It is essential that the central bank demonstrates a strong determination to act as a lender of last resort for risky assets as well. From this perspective, the large-scale purchases of long-term riskless and risky assets by some major central banks during the Global Crisis were essential for the reduction of the risky long-term natural rate. This point of view calls for an as yet non-existent serious analysis of the pros and cons of extending the range of eligible assets for open market operations to private sector debt and equity instruments. Some information on this issue is provided by He and Krishnamurthy (2013). Using a model of occasionally binding equity issuance constraints they show that, in a crisis, equity injection is a superior policy compared to interest rate cuts or bond purchasing programs by the central bank. Incorporation of the natural levels of risk and of risk aversion into a natural risky rate concept is likely to pave the way for shedding new light on the relative desirability of alternative asset purchase programmes. Bernanke, B and M Gertler (1989) "Agency costs, net worth, and business fluctuations", American Economic Review, 79(1): 14–31. Bernanke, B, M Gertler and S Gilchrist (1999) "The financial accelerator in a quantitative business cycle framework", in J Taylor and M Woodford (eds), Handbook of Macroeconomics, vol 1C, Amsterdam, Elsevier Science, North-Holland: 1341–93. Cukierman, A (1992) Central bank strategy, credibility and independence: Theory and evidence, MIT Press, Cambridge, MA. Cukierman, A (2016) “Reflections on the natural rate of interest, its measurement, monetary policy and the zero lower bound”, CEPR, DP 11467; also published in E Gnan and D Masciandaro (eds), Central banking and monetary policy: What will be the post-crisis new-normal?, SUERF Conference Proceedings 2016/4, Larcier. Cukierman, A and Y Izhakian (2015) "Bailout uncertainty in a micro founded general equilibrium model of the financial system", Journal of Banking and Finance, 52: 160–179. Curdia, V (2015) "Why so slow? A gradual return for interest rates", Federal Reserve Bank of San Francisco Economic Letter, 12 October. Curdia, V, A Ferrero, G Ng and A Tambalotti (2015) "Has US monetary policy tracked the efficient interest rate? ", Journal of Monetary Economics, 70(C): 72-83. Gali, J (2008) Monetary policy, inflation and the business cycle: An introduction to the New-Keynesian framework, Princeton University Press, Princeton and Oxford. Gilchrist, S and E Zakrajšek (2012) "Credit spreads and business cycle fluctuations", American Economic Review, 102(4): 1692-1720. He, Z and A Krishnamurthy (2013) "Intermediary asset pricing", American Economic Review, 103(2): 732-770. Kozlowski, J, L Veldkamp and V Venkateswaran (2015) “The tail that wags the economy: Belief driven business-cycles and persistent stagnation”, Manuscript, NYU. Laubach, T and J Williams (2003) "Measuring the natural rate of interest", The Review of Economics and Statistics, 85(4): 1063-70. Laubach, T and J Williams (2015) "Measuring the natural rate of interest redux”, Federal Reserve Bank of San Francisco, WP 2015-16, October. Taylor, J and V Wieland (2016) "Finding the equilibrium real interest rate in a fog of policy deviations", CEPR, DP 11264. Wicksell, K (1936) Interest and Prices (translation of 1898 edition by R F Kahn), Macmillan, London. Woodford, M (2003) Interest and prices: Foundations of a theory of monetary policy, Princeton University Press, Princeton, NJ. A detailed description of the methodology and of its underlying assumptions appears in Curdia et al (2015). This drop is particularly remarkable in view of the fact that the natural rate for 2006 is estimated to be 4% – implying that during the five years between 2006 and 2011 the natural rate decreased by 8%. Their methodology draws on Laubach and Williams (2003). An early analysis of the impact of this motive on the monetary policy rule appears in chapter 7 of Cukierman (1992). See also Taylor and Wieland (2015). Figure 1 in Gilchrist and Zakrajsek (2012) provides support for this view by showing that the spread between risky and riskless US rates was at an all time high precisely when the short term policy rate reached the zero lower bound. Actually, it is possible that, even in the absence of a ZLB, conventional short term interest rate policy loses much of its punch due to huge increases in demand for liquidity during crises. Cukierman and Izhakian (2015) argue that the decision not to bailout Lehman and the ensuing panic permanently raised the public’s aversion to bailout uncertainty. Kozlowski et al (2015) argue that, since observations on the realisation of tail risks are rare, they have persistent adverse effects on beliefs and the economy.